The front of the computer console is for you, dear computer user. You use the front of the console to interact with the computer system directly. 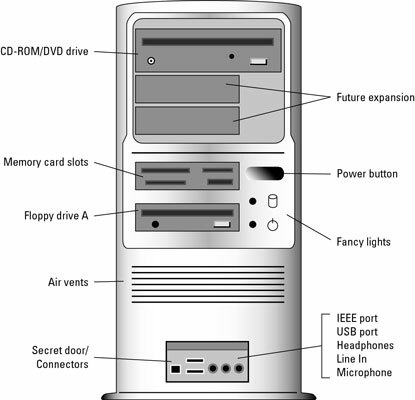 From the front of the console, you can add or remove disks, observe lights, punch buttons, and perhaps even plug one or two special items into the PC’s tummy. Things to note on the front of the console. DVD drive: Like a music or video player, your computer digests CDs and DVDs through a slot or tray on the front of the console. The DVD drive consumes both CDs and DVDs. Future expansion: Some spots on the console’s nose may look like they’re DVD or disk drives, but they’re not! They’re simply blanks that cover holes — holes you can use for adding things to your computer someday. Memory card slots: Various slots for inserting digital memory cards, such as those used in digital cameras or other portable electronic gizmos. Air vents: Okay, this one isn’t impressive, but most consoles sport some type of air vent on the front. Don’t block the air vents with books or sticky notes! The thing’s gotta breathe. The secret panel: Some PCs, especially home models, have a secret panel or door that pops open. Behind it, you can find connectors for joysticks, microphones, headphones, digital video, or other handy items you may need to plug and unplug from time to time. Buttons and lights: Most of a computer’s buttons are on the keyboard. A few of the more important ones are on the console, such as the power button and reset button. These buttons are usually accompanied by impressive, tiny lights.